Come home to a tasty, delicious dinner after a long day’s work. 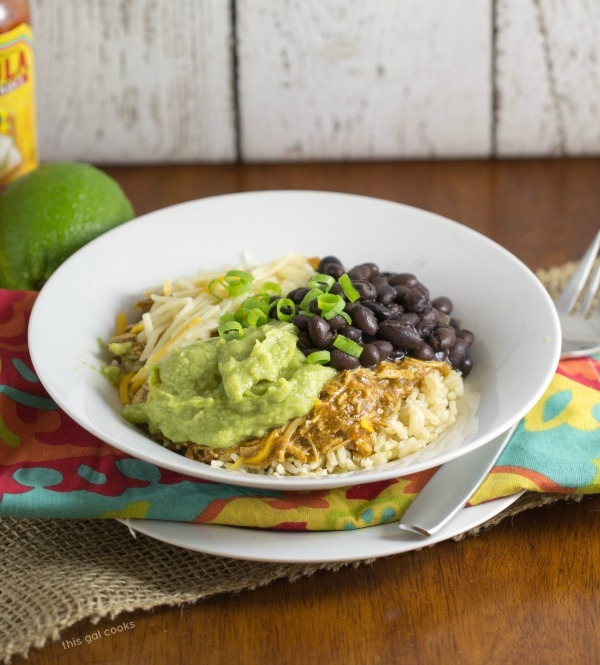 These Crockpot Chicken Burrito Bowls require minimal prep time and are on the table in less than 15 minutes once done slow cooking! I love Mexican style food. I like eating it. I like making it. I REALLY like making it. There’s this Quick & Easy Cheesy Taco Casserole that I made a while back. Oh and this absolutely swoon-worthy Taco Lasagna. Tacos. Lasagna. Nuff said. And last night I made something special. Seafood Enchilada Pasta Bake. Creamy sauce with shrimp and imitation crab meat (come on, the real crab meat is too expensive right now!) mixed with ziti, topped with cheese. Yum. You’ll want to stay tuned because I’ll be sharing that tasty goodness very soon. Crockpots. Oh yea, I love them too. I especially like making chicken dishes in them. 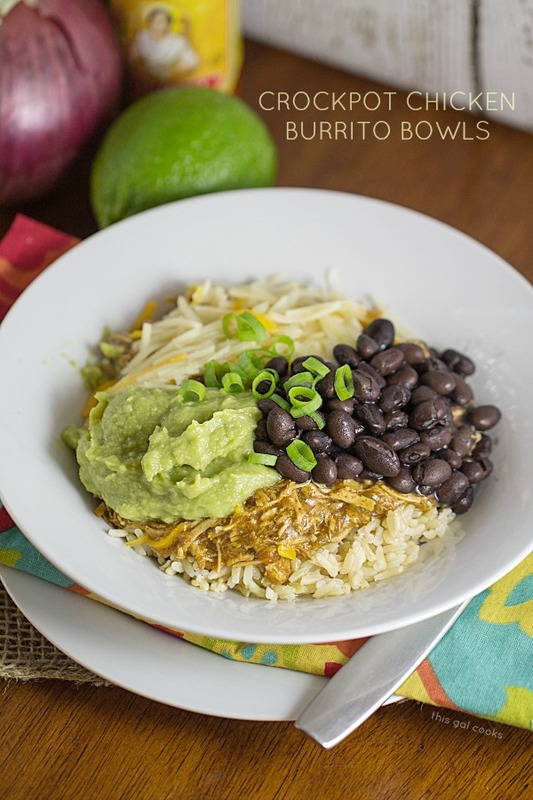 These Crockpot Chicken Burrito Bowls were no exception. Who can resist throwing a few ingredients into a crockpot when the results are a tasty dinner waiting for you when you get home? For this recipe, I threw a couple of chicken breasts into my crockpot. Then I added chopped fresh tomatoes and onions, some diced green chilis, a can of beer and some homemade taco seasoning. I cooked this on low for 8-9 hours. You could probably cook it for 5-6 hours but I was at work so 8-9 hours had to do. It still came out great even after 9 hours of slow cooking. I served this with brown rice and topped it with guacamole, black beans, shredded cheese and green onions. Feel free to top it with your favorite toppings. There was enough of this to last Ken and I for a few days. You can freeze excess leftovers. But if you’re feeding a crew, you’ll definitely have enough to go around. I hope you enjoy this recipe! Spray your crockpot with cooking spray. Place the chicken breasts in it. Add the tomatoes and onions. Mix together the beer and taco seasoning and pour it over the chicken and veggies. Top with the diced green chilis. Cover and cook on low for 4-5 hours*. After it's done cooking, gradually whisk in cornstarch until desired thickness is reached. Season with salt, to taste. Toppings will alter the nutrition information. Cooking time will depend on the size of your slow cooker and how hot your slow cooker gets. I use a 3.5 quart Cuisnart slow cooker and it takes 4-5 hours to cook chicken breasts; however, my old 6.5 quart slow cooker took 7-8 hours to cook the chicken. You’re welcome, Deborah. Thanks so much for stopping by! I love Mexican food too Julie, we eat it several times a week! Will be adding this to my mail rotations! Thank you, Marcie! I’m glad you enjoyed this recipe! Yum, I love burrito bowls! I still need to pull out the crockpot and start using it. ;) It would definitely make dinner time easier!! Yes, yes you do, Lisa! Your crockpot must be feeling pretty neglected right now. Hey Now :) Im down with all crock pot recipes! This would be perfect on one of my Taco Tuesday nights! Yeah! It would be perfect for Taco Tuesday! Yum, we love Mexican food too! 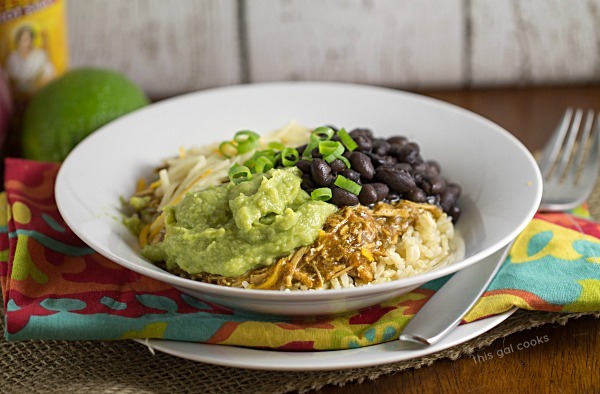 This burrito bowl looks amazing Julie! Absolutely love that it’s made in the crockpot and that you can freeze leftovers too :) Pinning and can’t wait to try this :) Hope you have a great week Julie! Thank you so much, Kelly! I hope you had a lovely weekend. Julie, this looks so fresh and delicious – and I love that it’s made in a crockpot, which is something I want to try to use more this year. Thanks so much for sharing – pinning and buffering! Hope you have a great Tuesday! Thank you, Cindy! You’ve gotta try getting more use out of the crockpot. Your life will thank you because you’ll be giving it time to do other fun things! I also love eating Mexican food and love making it even more. It seems like I can’t go one week without putting a Mexican spin on dinner at least once. The only thing is usually it require quite a bit of prep, love that this is all done in the slow-cooker! I love one bowl recipes! Mexican food is amazing!! It sure is amazing, Layla! Thanks for stopping by! We are total Tex-Mex freaks over here too! :) The sauce in this crockpot chicken dish sounds incredible. Love all the “extras” you added to this too with the guac, tomatoes, black beans, etc. Sounds perfect with a Corona! :) Pinning girl! Now I want a crockpot so badly… too bad they aren’t sold here :–( This stuff looks amazing, what a perfect dinner! And the crab-ziti thing sounds out-of-this-world awesome… I can’t wait to hear more about it! Oh darn, that stinks! Maybe one day they will sell them there? One can hope, right?! I am working on the seafood enchilada pasta bake post. I’m hoping to have it up by tomorrow afternoon! Sooo bookmarking this!! Love that there’s beer in it – very cool!! You’ve gotta break out that crockpot, Jamie! It can be such a life saver when it comes to cooking. :) Thanks for stopping by! Burrito bowls are my go to lunch when I’m running around the city. I totally need to try this recipe so I can make them myself. Your pictures look SO good!! Thanks so much, Meghan! I love stopping in to Chipotle and getting a burrito bowl from them! But making them at home does save money! Thanks for stopping by. Hi Julie, I am making this for my dinner tonight and wondeingr if I shred the chicken after it is cooked?? it looks like it in your picture but I just want to make sure! Cant wait to try this!!! I was wondering if you could cook this on high for 4hours? You could definitely try it. If you’re able to, you may want to check the chicken after 3 hours of cooking. Some crockpots seem to run hotter than others and if the chicken over cooks, it will be a little dry! Is there something you can substitute for the can of beer in the recipe? You could use chicken broth in place of the beer. It will change the taste but it will work! Chicken, beans, and spinach herb tortilla.